Last week was English Wine Week, the annual celebration of our home-grown product. The Romans made wine in Britain, but for much of the time since, amounts produced were tiny. It was only in the 1950s that the first signs of a real revival began and continued in the 1980s and 90s. But in recent years the number of vineyards planted here has grown rapidly – there are now almost 500 operating commercially. More than half of those represented at a South West Vineyards Association (SWVA) tasting I attended recently had released their first vintage within the last 10 years. The SWVA covers our most local producers and the tasting gave me the chance to meet up with some of them. Three relative newcomers to the scene are just a stone’s throw away from each other a few miles south of Bristol: I’ve blogged about Dunleavy’s attractive Pinot-based rosés before and eagerly await their first sparkling release later this year. Nearby Aldwick Court already produce a pair of sparklers but it was their still ‘Mary’s Rosé’ that particularly interested me – a crisp, fresh blend of Pinot Noir, Regent and a variety new to me: Solaris. Tiny (2 acre) Sutton Ridge Vineyard is the 3rd of this group and their rosé, this time made with Regent and Phoenix, has just won a Gold at the WineGB awards. Further south, near Dorchester, is another relative newcomer – the Langham Wine Estate. Again focussing on sparkling wines, their delightful appley fresh Classic Cuvee is also an award winner – this time, a Sommelier Gold. Some branches of Marks & Spencer are stocking it. Of the longer established south-west vineyards I have a special affection for Oatley, near Bridgwater. I first met the owners almost 20 years ago when I interviewed them for a piece I wrote in the Somerset Magazine, my first published article. Sadly, all the others I talked to at the time have long since closed, but Oatley continues to thrive thanks to their loyal customers. Nearby, Smith & Evans vineyard may only date from 2008 but, in that short time, they have established themselves with some high quality sparkling wines made from the Champagne varieties – their 2011 vintage winning a Silver at the prestigious International Wine Challenge. Over in Wiltshire, A’Beckett’s Vineyard released their first wines in 2003 but they don’t just sell wine – they have diversified into cider, apple juice and honey – and all from their own farm. Finally, Astley Vineyard in Worcestershire is one of the oldest surviving English vineyards, beginning in 1971 and with some vines planted then still producing. But, even here, things are changing with new owners taking over last year. It will be interesting to see how they develop the estate. English Wine is not just changing – it’s also improving all the time as the number of international medals and awards prove. Do give it a try if you can – and not just during English Wine Week. Finally, a word of clarification: I’ve seen English or Welsh wine incorrectly referred to recently as ‘British wine’. British wine is produced from imported grape juice or sometimes grape concentrate and is not recommended; English (or Welsh, if appropriate) Wine is a quality product made from freshly picked grapes and reflects the place where those grapes are grown. Celebrating English Wine – Again! English Wine Week ends today (Sunday June 5th) and, of course, my wife and I have been celebrating by tasting some delightful examples over the past few days. But we also made a brief trip to Devon to visit a couple of the vineyards that are contributing to the rise and rise of English wine. Devon may be less well-known as a source of English wine than, say, Kent or Sussex, but there are more than 20 producers there and its mild, Atlantic-influenced climate makes it a perfect place to ripen grapes, especially for crisp, refreshing (mainly white) wines. Many of the county’s growers are small scale and only open to the public by appointment but others, like Sharpham, near the historic town of Totnes, welcome visitors daily (see www.sharpham.com for details). There, you can have a delicious lunch overlooking the vineyard (with a glass of their local product, of course! 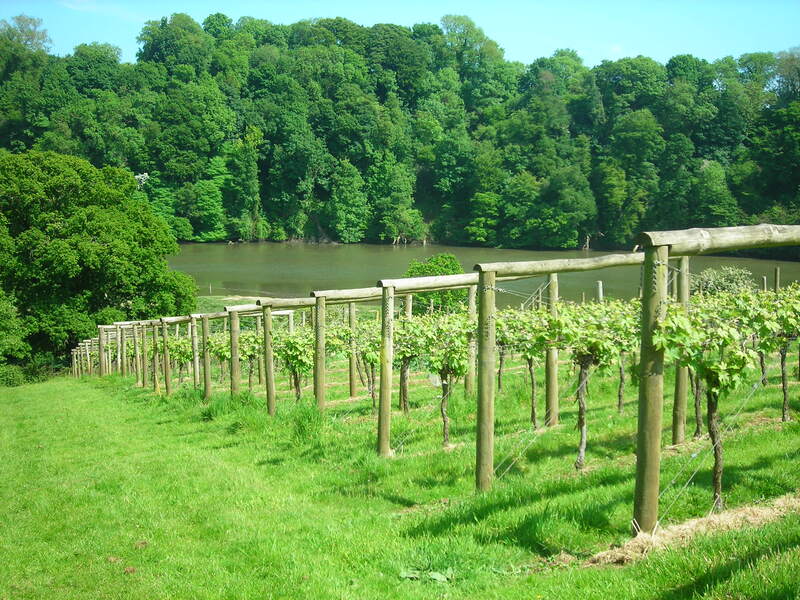 ), taste a selection of wines and cheeses made on the estate and, if the weather is fine (as it was when we visited) take a marvellous walk among the vines and alongside the picturesque River Dart (see below). 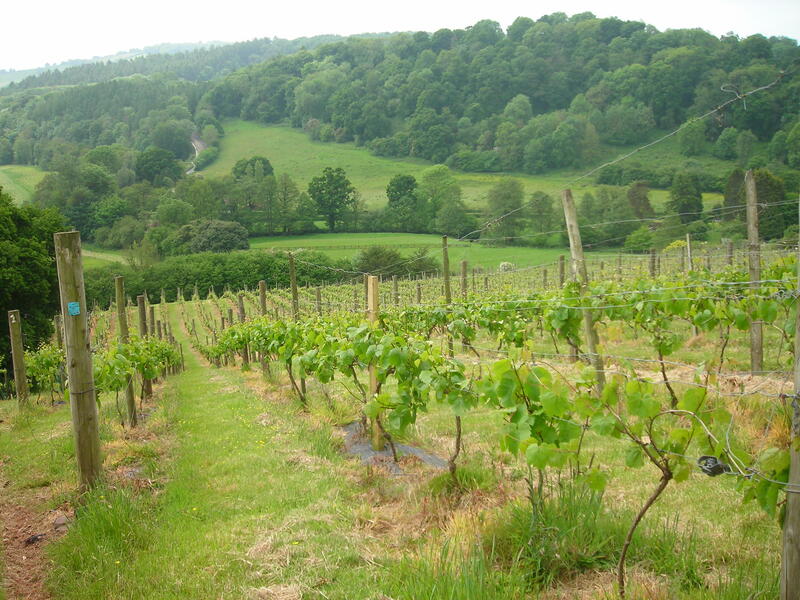 Further north in the county, near Tiverton, is another of our favourite Devon vineyards: Yearlstone. Smaller and less commercial than Sharpham, you always get a warm and personal welcome here – not least from the resident dogs! Timing your visit around lunchtime is a good idea as they, too, have an excellent café but you can also taste the wines and enjoy a peaceful stroll in the vineyard with its wonderful views over the Exe Valley (see below). Yearlstone’s wines are well worth trying; they aren’t widely available outside the county, but you can buy direct from the vineyard (www.yearlstone.co.uk). And that, perhaps, is part of the problem with English (and Welsh!) wines: they are made in relatively small quantities and so aren’t on every wine merchant’s or supermarket shelf. But do look out for them; either ask your local wine merchant or, if you have a branch of Waitrose close by, they are great supporters of English wines and have Sharpham as well as many other local names on their list.